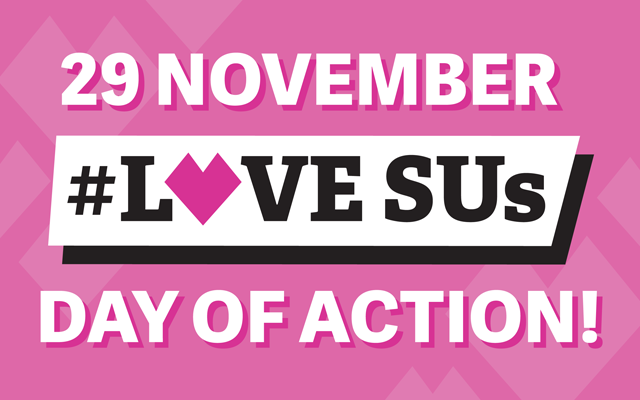 Thursday 29 November will be #LoveSUs Day of Action, where we come together to highlight the impact of students’ unions on individual students and why we're incredibly proud of all our amazing work. On #LoveSUs Day we'll be asking you to highlight the positive impact your students' union has had on you. We are hoping to promote your incredible stories, so if interested please get in touch with us and join the campaign. You can use our templates to share your own story and add our twibbon. We'll be sharing more information about the campaign here, so save the date and share the word because we all #LoveSUs!